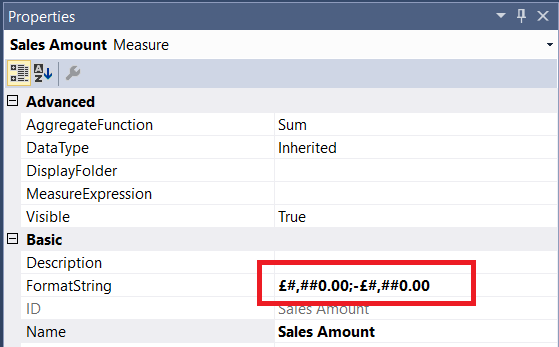 What’s more (and this is a bit strange) if you look at the DAX queries that are generated by Power BI to get data from the cube, they now request a new column to get the format string for the measure even though that format string isn’t used. Since it increases the amount of data returned by the query much larger, this extra column can have a negative impact on query performance if you’re bringing back large amounts of data. Thanks to Kevin Jourdain for bringing this to my attention and telling me about the workaround, and also to Greg Galloway for confirming the workaround and providing extra details. The disregard for SSAS format strings by client tools has been a frustrating issue for years, in my experience. Microsoft tools are the major offender. Setting the format strings in SSAS makes for a centralized, more easily manageable repository for client consumption. I have spent days ensuring consistent format strings in large collections of calculated measures, only to have to repeat the work by building template reports in the client tools, or by issuing documentation to users in the hopes that they will properly format measures in the reports they create. Is it me, or does the dynamic formatting still not work? I don’t see any dollars in the last screenshot. The point is that some formatting might be better than no formatting at all, and a calculated measure is the only way to get some formatting to work. Sorry not to be clear. OK thanks. It really annoys me that Power BI doesn’t support some SSAS MD properties really well. Luckily the client is also a heavy Excel user, so the formatting is not lost everywhere. I have to say, the fact that you can’t format a number in Power BI makes it useless to me. I prefer writing as much as I can in SQL and use Power Query, where I can format the number to my heart’s delight in Excel. Creating a measure to format a number makes no sense! I don’t understand why they don’t add that option to the column/report itself. Seriously aggravating. I don’t know – I don’t think so. Maybe there is some other feature you are using in your cube that is stopping this working? Thanks for your answer Chris. I will try to create a very simple cube to test this. I have tried several of our cubes without success so that’s why I was thinking it might be the server version. I actually works with a simple cube. And I found couple of our cubes that it works with as well. Now I just need to find out what it is with our more complex cubes that prevents it for working. Do you know if there is any documentation from Microsoft on this? Thanks for posting on this important issue. I still am not able to solve this problem. I have some calculated member and then used in the YTD timecalculations with base measures. Please see the code below. This code is in production for over a year and was working in PowerBI very good. Now for somedays both percentage formatting and decimal formatting is gone. Your workaround of creating another calculated member i cannot get it for Time calculations working. Do you have any idea on how to get this working. Thanks! 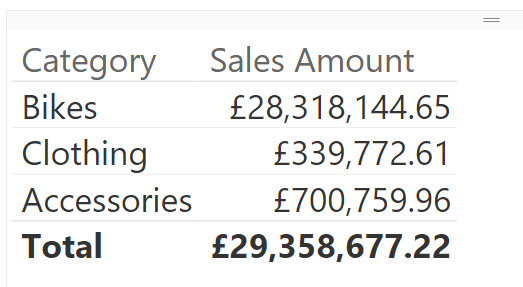 Unfortunately, as I say in the post, there is no workaround – dynamic number formats like this don’t work in Power BI. Sorry! But when it comes with cost centre, it should return the values sum of max (No of Positions) .i.e. Sum(Max(No of Positions)) or Sum(Max(No of Candidate)). When the data slices, for Job or Candidate Id attributes the No of Positions should be 1 for Job 1 and 2 for job 2 and 3 for Job 3 but for the cost centre attributes the No of Positions should be 1+2 (C1) and (2+3) for C2. I don’t know where am I making mistake. Thanks for the reply. I read the blog you mentioned in your reply but i have different scenario. my scenario to create one measure and it behaves different at different dimension. Say my measure name is NoofPosition. The NoOfPosition should be the max value at Job dimension and at cost centre it should be Sum of Max(NoOfPosition ). The code does not work and when I browse the measure in excel and it is nonstop running and never give me the result. 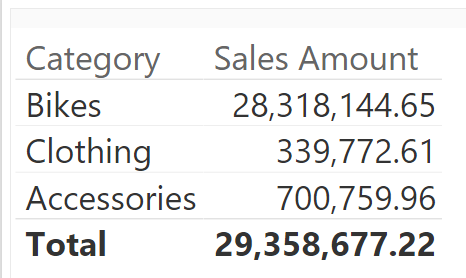 I was testing in Power BI today and while the percentage formatting came through in the table visualization, when I tried a chart the values went to decimals with no way to format the value or axis as percentage. PowerBI with Mulidimensional is a letdown. Do you think the MS response would be “rewrite your cubes in tabular”? This is still not fixed. Not sure why the Power BI team has not fixed this formatting issue with chart visualizations. Hi all, still there are issues in formatting both in PowerBI Desktop and PowerBI Service. 1)If there are scopes statements with dynamic(this keyword) before calculated members, formats on all measures in charts are not displayed.